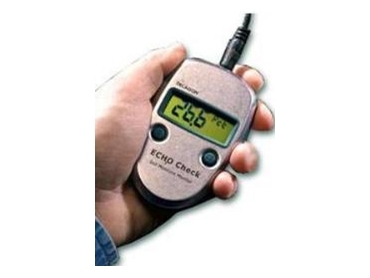 The ECH2O Check from Envco Environmental Equipment is a hand-held readout device for use with ECH2O EC-10 and EC-20 probes. With ECH2O Check, users can make rapid measurements of their installed ECH2O probes. Users can plug in the ECH2O probe's 3.5mm connector and press the left button of the ECH2O Check to get an instant reading of water content. They can also adjust the calibration of the ECH2O Check for the specific soil type they are measuring. Readings are displayed in units of volumetric water content (m3/m3), inches per foot (in/ft) or millivolt output. The ECHO Check handheld meter provides a convenient readout for the field. The ECH2O Check is for use only with the EC-5, EC-10 and EC-20 model of ECH2O probes. It does not currently measure the ECHO-TE sensors.